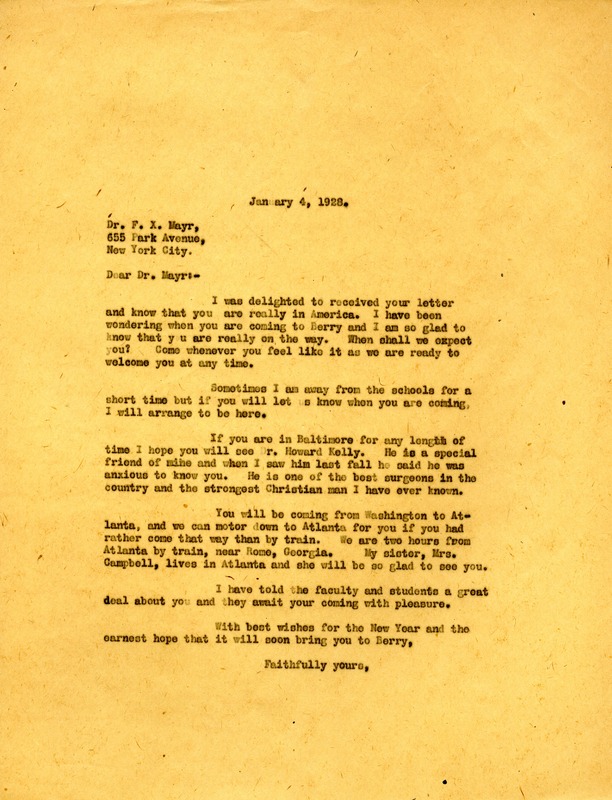 The letter welcomes Dr. Mayr to America as well as inquiring when he is coming to visit the Berry Schools. Miss Berry mentions colleagues that Dr. Mayr may want to meet as well as options of transportation to get to Berry School. Miss Martha Berry, “A letter to Dr. F. X. Mayr from Martha Berry.” Martha Berry Digital Archive. Eds. Schlitz, Stephanie A., Cassidy Sangrey, et al. Mount Berry: Berry College, 2012. accessed April 21, 2019, https://mbda.berry.edu/items/show/8389.